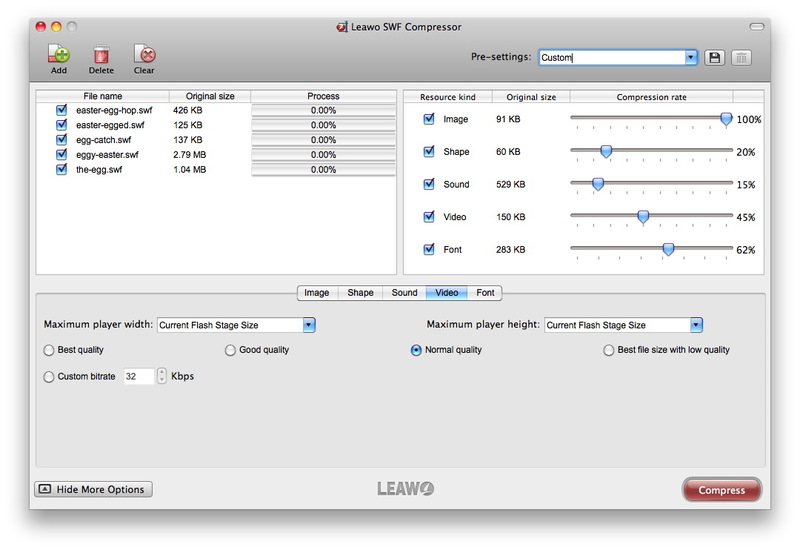 Leawo SWF Compressor for Mac is the best application for Mac users to compress SWF files by up to 70% with least quality loss. 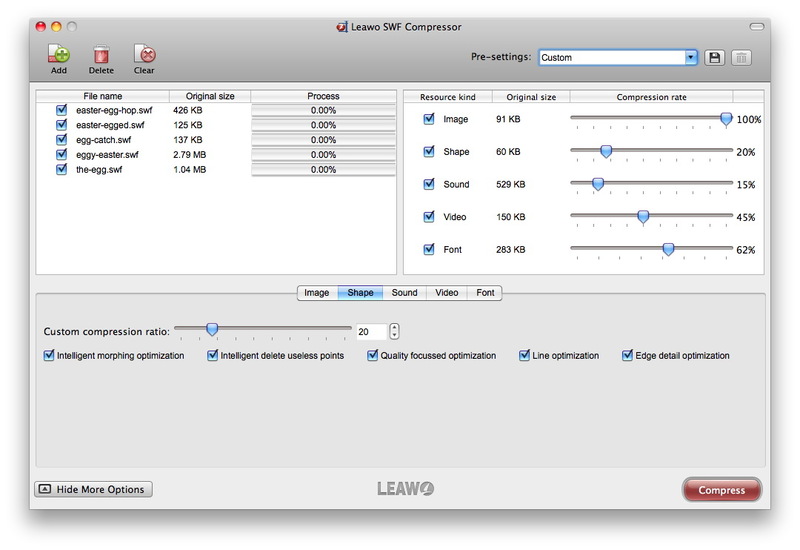 By using Leawo SWF Compressor, all kinds of SWF files such as Flash banners, Flash slideshows, Flash animations, Flash games, Flash movies and Flash projector EXE, etc. can be compressed to a desired size, thus saving considerable amount of space, traffic and loading time. 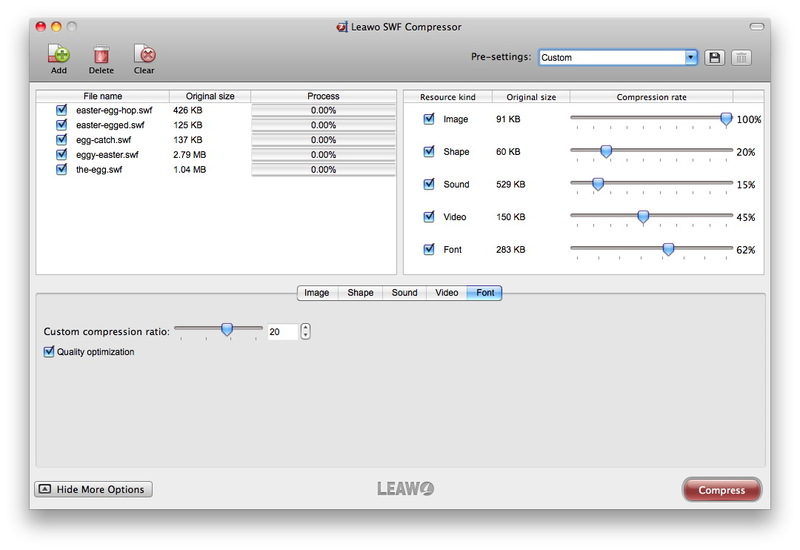 Follow the guide below to learn how to compress SWF file using Leawo SWF Compressor for Mac. When you run the SWF Compressor Mac, you will get the start interface as below. Just click“Add” to import SWF files. This application supports batch processing, so you can add multiple SWF files and compress them at one time. Choose a predefined compression setting from the “Pre-settings”. “Best” is what we recommended for the smallest output with optimal quality. 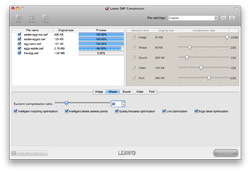 Other settings such as “Good”, “Basic”, “Medium” and “Sprite” offers different compression solutions for your SWF files. Besides the 5 pre-settings, you can also choose “Custom” so that you can modify every compression parameter as you like, which are grouped in 5 categories: Image, Shape, Sound, Video and Font. Click “Show More Options” button and the Extended Settings Panel will show up. By optimizing images in SWF files, you can reduce the SWF file size. Delete metadata: Delete metadata like author details, date, time, etc. Force to jpeg: Force PNG, BMP, or GIF format into JPEG to save space. Delete invisible area: Delete the invisible area of an image in SWF file. Intelligent optimization: Replace image color and alpha channel with simpler approximator. Image quality: Zoom out the image or customize compression ratio to reduce the SWF file size. Truncate shapes by removing or replacing groups of shapes with optimized ones to reduce the SWF file size. Intelligent morphing optimization: Intelligent adjust the smoothness of morph. Intelligent delete useless points: Remove intermediate points that are not crucial for the SWF movie. Quality focussed optimization: Adopt the optimal algorithm to keep the original shape quality. Line optimization: Replace original curve with more or less identical line. Edge detail optimization: Replace the curve edge with an extending angle. By optimizing sound in SWF files, you can reduce the SWF file size. Encoding: Choose CBR, VBR or ABR encoding to your need. Quality: Choose the quality level or custom sound bitrate yourself to control the output size. Sound Channel: Keep stereo or force sound channel to mono. By optimizing video in SWF files, you can reduce the SWF file size. Video size: Custom the output video size according to the player. Quality: Choose the quality level or custom video bitrate yourself. Each time you use a new font, you embed a new set of characters. So use too many fonts in the SWF file could increase the file size. 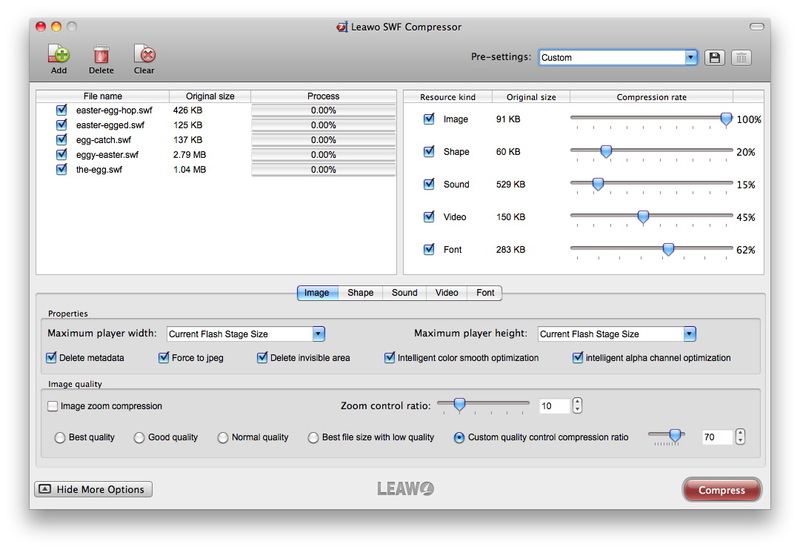 Custom compression ratio: Drag the slider to adjust the compression ratio. Click “Compress” button and the compression task begins. You will see clearly the processing status of each SWF file in the task list.